What’s More Interesting than a Train Wreck? Note: This is the tenth in a series of historical/critical essays examining the best in film from each year. Essentially, I am watching films from the beginning of cinematic history that interest me and/or hold some critical or cultural impact. My personal, living list of favorites is being created at Mubi, showcasing five films per year. All this being explained, what follows is an examination of my fifth favorite 1900 film, A RAILWAY COLLISION, directed by Walter R. Booth. A RAILWAY COLLISION (1900), also known as A RAILROAD WRECK, is the most unconventional film to make it onto my yearly favorites list so far, and will probably maintain that position for quite some time. It’s not that its content is overtly over-the-top or surreal, or that its construction is quite so innovative or singular from a modern lens. Quite honestly, it’s much more underwhelming than it is exciting at first blush, which actually makes it a standout among my favorite films, the ones that impressed me and stayed with me. The curio is a brief 45 seconds or so, and features two model trains crashing into each other. There isn’t a narrative, per se, and the “special effects” look quite unconvincing to the modern, media-trained eye. Nevertheless, some intriguing context reveals A RAILWAY COLLISION’s subtle, quiet contributions to film, and they shouldn’t be overlooked. A RAILWAY COLLISION was directed by Walter R. Booth and produced by Robert W. Paul, two major pioneers in the British film industry. Booth, like his French contemporary Georges Méliès, was a magician intrigued by the possibilities offered by the fledgling cinematic art form. With a similar flair for astonishing, and a desire for memorable showmanship and tricks, it makes sense Booth would also turn to trick films over simple actualities. Booth’s career actually mirrors Méliès’ quite closely, albeit in a delayed fashion. Booth’s earliest trick films, such as THE MISER’S DOOM (1899) and UPSIDE DOWN; OR, THE HUMAN FLIES (1899), preceded some adaptation work, in the form of THE LAST DAYS OF POMPEII (1900), and a handful of actualities nevertheless made their way into the filmmaker’s canon along the way to epic scale fantasies like SCROOGE, OR, MARLEY’S GHOST (1901). Booth would also end his narrative film career amidst the changing film industry of the mid-1910s in relative obscurity, turning to advertising films. Ultimately, though, Méliès’ influence is stamped across a lot of Booth’s work, but A RAILWAY COLLISION, ironically, is set apart from either’s body of work due to its synthesis of the actuality and the trick film. Even though Booth, at times, showed an eye distinct from his contemporary, the business acumen of director, producer, and film pioneer Robert W. Paul may have steered Booth into adopting the filmmaking style Méliès was making popular. Coincidentally, Paul’s foray into the film industry gave Méliès his start as well. Paul operated his own technical instrument-making firm, and was approached to make a copy of Thomas Edison’s Kinetoscope. Finding that Edison had not patented the device in Britain, Paul purchased his own, took it apart, found out how it worked, and manufactured his own. One of them found its way into Méliès’ hands. Since the Edison machines could only play Edison films, Paul teamed up with another British film pioneer, Birt Acres, and in 1895, they made the first English film camera: the Paul-Acres Camera. Paul and Acres both directed films during their partnership; one of Paul’s earliest was FOOTPADS (1895). And both worked on projection technology, which had seemingly never occurred to Edison, after dissolving their partnership. Paul’s, the Theatrograph, would premier later but end up being more successful, and was shown the same day in 1896 that the Lumière brothers’ films were first projected in London. By 1898, Paul had created Britain’s first film studio, Paul’s Animatograph Works in Muswell Hill, where Booth would join him in 1899. Eventually, he exited the film industry around the same time as Booth and Méliès, perhaps as early as 1910. Paul had been maintaining his technical instrument-making business simultaneously, and focused on that in his later days. Nevertheless, he ended up representing the vast network of inspirations, original innovations, and sheer theft that made up the early film technology industry, contributing to its growth in the process. So what does all this have to do with a 45-second film showing two model trains crashing into each other? Well, I obviously don’t know what the working relationship between Booth and Paul looked like, but I can imagine the showman and the business-like inventor they were being excited with the possibility of A RAILWAY COLLISION being a technically convincing film, and their backgrounds clued me into the circumstances surrounding its creation. According to contemporary sources and modern historians, audiences thought the film to be a genuine account of a real event. Some even exclaimed that it was lucky the filmmakers were already filming and were able to capture the accident. Of course, today, we can see the film as what it is: a well-built miniature set through which a neat model train runs through. The very idea of filming model trains to convince audiences of action that could not be simulated or recreated without serious cost or at all, though, is an important leap forward in filmic special effects. 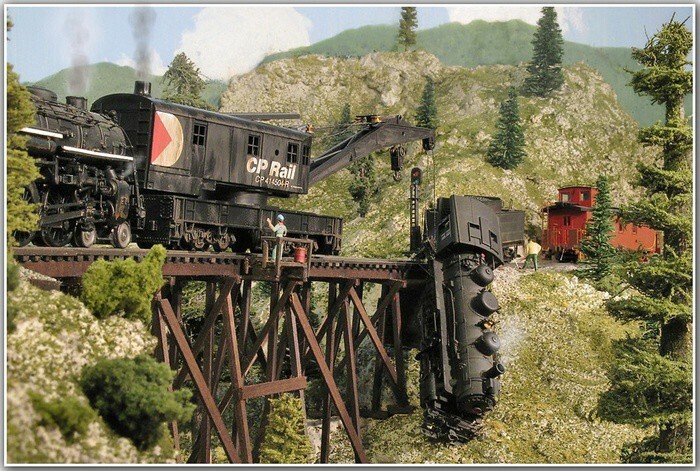 Booth and his contemporaries had already worked with substitution splices, jump cuts, and “real” conjuring tricks to bring magic and action to the screen, but the use of a scale model in A RAILWAY COLLISION is a huge film landmark. Scale models were and are the basis of every film moving into “over-the-top” or astonishing territory, before intricate, live on-set recreations, puppetry, animatronics, or CGI were possible or feasible. 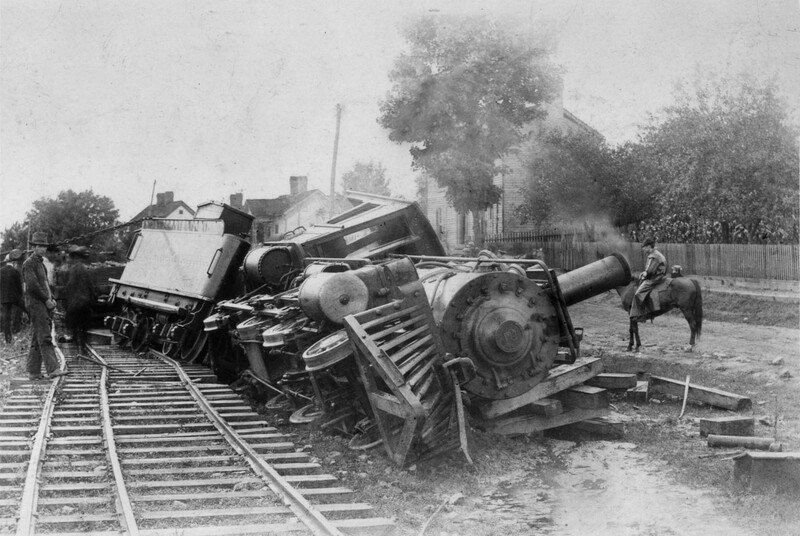 And A RAILWAY COLLISION was one of, if not the, first to do it. Ironically, A RAILWAY COLLISION was heavily pirated and duplicated in America for the Kinetoscope, a fitting turn of events after Paul’s manufacturing of Kinetoscope copies in England at the start of his film career. The film’s success in both America and England means a lot of eyes were on it, eyes that would make their own imitations in the years to follow, and others that would splice real footage and other staged recreations to create full-fledged action scenes in narrative films. 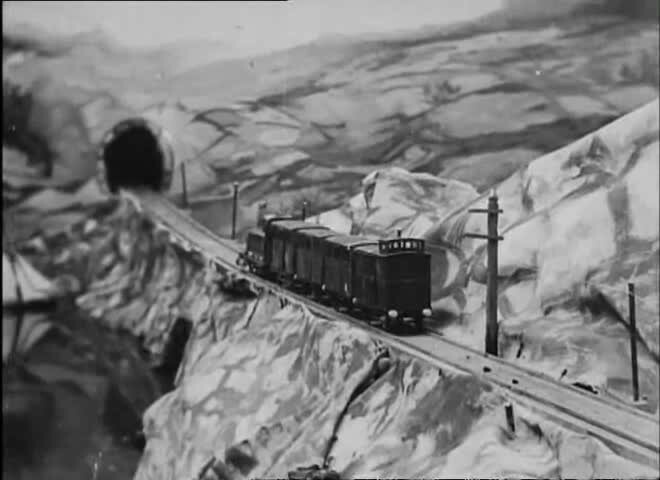 A RAILWAY COLLISION served as an important base from which more impressive and convincing special effects could be built and integrated into a story. As I mentioned at the start of this essay, A RAILWAY COLLISION is the most unconventional film I’ve written about. It lacks a lot of the elements we expect from a film, whether it be from 1900 or today, the absence of any sort of personage or character is not the least of which. It probably also requires the most context or explanation of what makes it special, while I’d like to think the rest of my favorites stand on their own. Further context always enriches a movie experience, in my opinion, which is why I’ve written thousands of words about my early favorites already, but there’s an argument to be made that great films are great regardless of whether or not you know who the director is or what was going on in the world at the time. Nevertheless, I think A RAILWAY COLLISION is a novel and very early technical feat in film, a bite-sized indication of how craft, in the truest and most traditional sense of the word, could be brought to the process of filmmaking. Make sure to catch up on and keep up with all of my essays on my favorite films here.